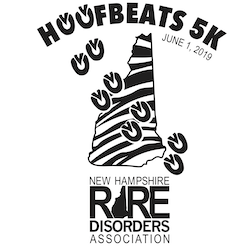 New Hampshire Rare Disorders Association is a 501(c)(3) nonprofit founded and operated by volunteers for rare disorders education, advocacy and awareness in New Hampshire and bordering states. New this year: You can create teams! The first person to register will be the team captain and create a team name. Teams may consist of any number of people (the more the better though! ), adults and kids. Teams made up of ten or more people will receive T-shirts with the team name printed on them! Please note: As flat as this course is it still has slight inclines/declines and a small patch of loose gravel. Since it's a double loop course you have the option of finishing after one loop. If you prefer to register via snail mail, a printable registration form may be found here. Create a team! The first person to register will be the team captain and create a team name. Teams may consist of any number of people (the more the better though! ), adults and kids. Teams made up of ten or more people will recieve T-shirts with the team name printed on them!